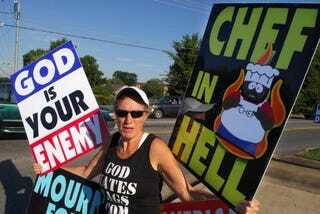 Member of Westboro Baptist Church at a protest. A 62-year-old man was arrested for allegedly trying to pepper-spray protesters who are members of the controversial Westboro Baptist Church in Omaha, Neb. The controversial group was protesting the funeral of Staff Sgt. Michael Bock, a 26-year-old marine who was killed in combat in Afghanistan's Helmand Province on Aug. 13. The incident took place at around 10 a.m. Saturday, where a score of followers of the extremist Kansas sect were staging a demonstration a block away from the funeral of Staff Sgt. Bock. The protesters were met by counterprotesters when local resident George Vogel drove by in his pickup truck and sprayed a "large amount" of mace in the air. We've said it before and we'll say it again: The right to free speech and protest isn't always free. Your rights might make someone feel free to take your blatant disrespect in his or her hands, like Vogel. Why are people concerned about the community center near Ground Zero and not Westboro Baptist Church members again?